Take that, Take That  The Nualas can do a reunion too! 3 divorces, 6 children and 200 botox injections later theyre back. A bit like your favourite brand of washing powder The Nualas are new, improved, yet somehow exactly the same. Expect some old favourites such as Chicken Shoes; Donald Sutherland and Manolo. Alongside fabulous all-new classics, such as 'Yummy Mummy Recession Blues', which premiered on RTE's The Late Late Show, March 4th, 2011. The Nualas re-launched in Dublins Vicar on March 25th  to an instantaneous standing ovation. In the lead up to that gig they achieved blanket coverage in the press: In addition to the coveted spot on The Late, Late Show, they, amongst many other items, featured on Irish radios Pat Kenny and Dave Fanning shows, and had major print coverage in The Sunday Independent, The Irish Mail on Sunday and The Sunday Times. During their 7 years together The Nualas achieved 17 theatre runs including 6 total-sell-outs at the Edinburgh Festival, and extended seasons in theatres in London, Dublin and New York. "The most downright funny act to hit town." - The Straits Times, Singapore. And completed five major tours, including a 64-date UK theatre tour. Venues played include The Grand Opera House, Belfast; The Gaiety, Vicar Street and Olympia Theatres, Dublin; The Cork Opera House & (as part of an Irish gala concert) The Royal Albert Hall, London. 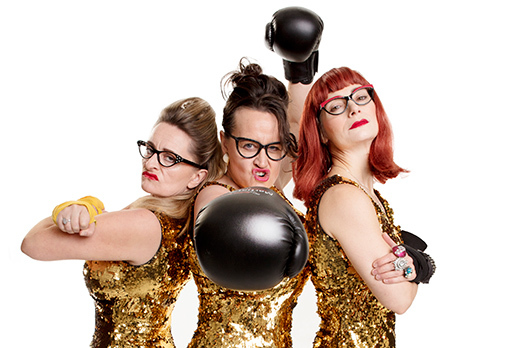 The Nualas recorded two radio series and a New Years Eve Special for BBC Radio 4, and appeared in a double-headline special of the first series of the BBC 1 TVs Stand-up show (with US comic Jon Stewart, anchor of US TVs The Daily Show. "Two longer sets from two significantly better-than-usual acts." - Time Out (London) TV Listing. They chalked up innumerable other radio and telly appearances from Singapore to Cork, including several stints on RTEs The Late Late Show. In 2001 they released The Big Shiny Dress Video with Sony. Their last run was their American debut  a three-week stint at The Irish Arts Centre in New York. It was extended to seven weeks such was the critical response. With writing as funny as theirs, these small-town Irish girls could sing about watching someone watch paint dry and we would still be riveted. The Independent, London. The Nualas are the new rock'n'roll. - The Independent, London. The cult queens of Ireland who put the b in bejaysus. - Metro, London. Dripping kooky, faux glamour, they will win you over with their nutty lyrics, zany tunes and endearingly silly dresses.They had a capacity crowd eating out of their hands. - The Evening Standar, London. Attractively rounded, witty antidote to the po-faced and cadaverous Corrs. Hilarious, stretch-sequinned, glitter-ball evening of bizarre comic songs and febrile Irish banter. - Time Out, London. When they skipped off behind the glittering backdrop for the last time, I was truly sorry to see them go. - The Times, London. Like true comedians they establish a superb relationship with their audience. You will be smitten. What's On, London. Dammit the Nualas can sing and make your face ache from laughing. - Time Out, London. The Nualas have put comedy and music in the blender and come up with a world class souflee. - Sunday Times, London.